We think it is just about one of the most vital rooms in your home (if not the most). And that’s why, when you’re looking for a change, revamp or upgrade it’s important that you put lots of thought into how to choose the right bathroom. Not only is the bathroom a necessary part of your living space on a convenient and functional level, but it can be a haven in which to relax and unwind. It also happens to be one of the rooms which can make the sale on a property when you’re looking to move on. It’s for all of these reasons that when you are looking for a new bathroom in Loughborough, you should have a think about how you’ll get it right, depending on the size and shape of the room in question. Ensuite, family bathroom or wet room? 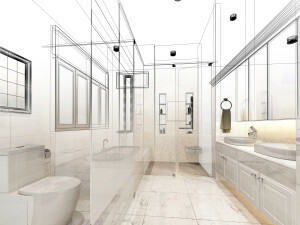 So, are you putting in a completely new bathroom, such as an ensuite, having a revamp to something more modern, going with the trendy wet room look, or is your family getting bigger and you need more space? When choosing a new bathroom, look to the things that are most important to have in there. For an ensuite, for example, do you really need lots of storage space, as well as a bath and shower? You’d be surprised how much space saving you can do when you cut out the bits that you don’t need. If it’s a family bathroom on the other hand, chances are you’ll need plenty of space for everyone’s stuff, so give thought to shelving and cupboards. If space isn’t bountiful, then consider cupboards on the walls, rather than the floor. What does your bathroom need to be? Should it be a functional space that gets you easily out of the house in the mornings? Do you even use the bath, in which case, would more space and a shower cubicle be better? If there are two of you using the bathroom at the same time and it’s a fairly large area, how about having two basins in there to help you save on time? Or, do you love a long relaxing bath of an evening, in which case, make sure it’s a pleasant environment with spaces to store all those luxurious oils, candles and creams that make it ‘oh so special’. If you can’t afford to completely overhaul your bathroom and put in an expensive new suite, then remember there are ways to make it look nice, without having a massive bill at the end. So, if you go for more basic units, give thought to the taps, tiles, mirrors and lighting, to add something special at a fraction of the price. There are plenty of great ideas about. If you are looking to improve or update your Loughborough bathroom and would like to find out more, then give us a call today about the options available to you. And remember, if you’re wanting to have it extra special, always get the professionals in to ensure it’s looking great first time!